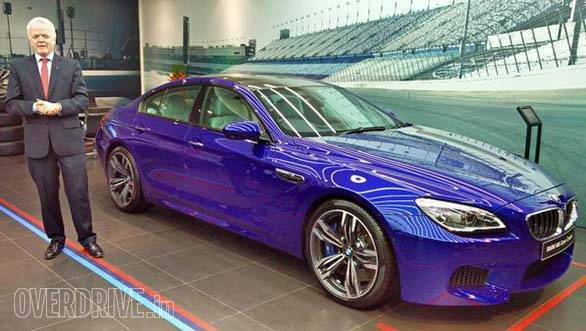 BMW have launched the updated M6 Gran Coupe in India at Rs 1.71 crore, ex-Mumbai. Changes to the car include new LED headlamps, updated tail lamps as well as a slightly altered grille. BMW have retained the swoopy silhouette from the outgoing car. Powering the new BMW M6 Gran Coupe is the same 560PS/680Nm 4.4-litre V8 motor which is capable of a 0-100kmph run in 4.2 seconds. The 7-speed M-DCT transmission also helps the car get to a claimed top speed of 250kmph. The new BMW M6 Gran Coupe also comes with start-stop technology which enables an impressive fuel efficiency of 10.10kmpl. Along with the launch of the new BMW M6 Gran Coupe, the company also opened its first ever M Studio in Santacruz, Mumbai. The BMW M Studio is based on the lines of rival Mercedes-Benz's AMG Peformance Centres - these are a new chain of showrooms where the M cars will be sold exclusively. BMW plans to set up seven more M Studio showrooms in India by the end of 2016. The company also announced that they will be investing Rs 100 crore into their financial services to allow BMW customers to opt for more flexible payment options.